The vanilla ice-cream cylinder with chocolate teardrops in raw food quality tastes great not just in summer but at any time of the year! 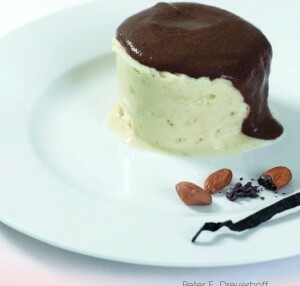 We are grateful to raw food head chef Peter E. Dreverhoff for this raw food recipe! Soak the cocoa beans in raw food quality for eight hours and then peel off the skin. Peeling the skin off the beans brings out the chocolate taste with greater intensity. Turn all the raw food ingredients for the chocolate sauce into the Vitamix® or the Personal Blender™ and process them into a smooth sauce. Cut the peeled bananas into pieces of about 2 cm in length and freeze them overnight. Then use the Green Star™ Elite juice press or Green Star™ Elite juicer (with homogenising screen) or the Vitamix® (if you use a less powerful appliance, the frozen bananas have to be slightly defrosted) to process with the pulp from the vanilla pod to make the ice-cream. Please consume while still fresh as the mixture will turn too hard if kept for too long in the freezer compartment. Place the serving ring on the serving plate and press the ice-cream into it. Smooth the ice-cream down and remove the ring. Use a spoon to spread the chocolate sauce over the cylinder, allowing one or two teardrops to drip down it. This entry was posted in Diary, Raw food recipes. Bookmark the permalink.